Remember that time on Big Brother 2014 that Caleb said he was over that (that being Amber) and he doesn’t care if they nominate her or vote her out of the Big Brother 16 house? Well, we all know that was a big lie and it was his coverup of seeing Amber get close with Cody. He is still obsessed and asked her on a “date” last night on the Big Brother live feeds! Check out the highlights from yesterday below in our Big Brother 2014 spoilers! >>>Click here for our Big Brother 2014 Live Recap tonight!!! The day consisted of a lot of the HGs sleeping and nothing going on. Brittany remains the target for the week, but she is not going down without a fight. She is out campaigning big time, but no one is really listening. She makes some good points and even offers to give her nominations away to people if she wins HoH. However, everyone is being nice and listening, but no one is changing their votes. As crazy as Caleb is about Amber, enter Zach into the picture and I think he missed a med or two lately. He almost went home during Week 2, but it didn’t phase him. 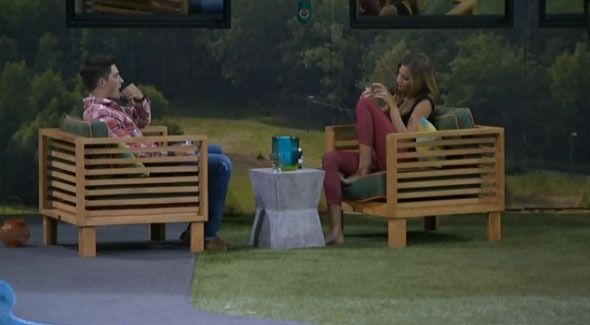 He is bored and likes messing with people, so he talks with Brittany and tells her he is voting for her and she should call a house meeting to see how people are voting. He thinks it will be fun. Cody and Derrick, not so much. They talk him off the ledge and he convinces Brittany no house meeting. Everyone thinks Zach is nuts and his boredom and need for entertainment could cause him to go home next week, as he was mentioned in a backdoor plan. However, Caleb takes the crown for “King of Crazy” and that could save Zach for another week. The HGs got a big alcohol delivery last night on Big Brother 2014 and while they were toasting, Caleb comes in and asks Amber on a date. She is hesitant, but Frankie tells her to just do it and she says fine. The other HGs joke and make fun of them as they walk out to the backyard. The “date” is them drinking wine and beer in chairs in the backyard and Caleb continues his talk about God putting them together and said he told production to book them a cruise after the show ends. The man has no brain and clearly thinks Amber likes him. He says it was his best date ever, which makes us feel sad for him! (For those wanting to watch, it started about 9:27 BBT on the feeds). Because of this obsession, Caleb will be the target for next week. They are all sick of him and know that he has to go before Amber. They think he will pull a Brendon and do everything in his power to win once his “woman” was evicted. We also have Cody very angry with Zach and wanting him gone. Frankie talks about Zach not making the final five with their alliance, but he talks about that with Caleb, who should be gone next week, right? We saw Victoria kissing Frankie. Brittany kissing Frankie. Cody wondering how Brittany kisses. Brittany and Amber never leaving Cody’s side, which Christine and Zach were venting about and making fun of the other HGs. Brittany gets in bed with Cody late at night, but in comes Zach and he joins them! (He is fun to watch, even if he gets annoying at times). This is all fun and good, but can we just get to Thursday night and see who wins HoH for Week 5 and how this next week will truly go??? Caleb has lost his mind. This kid is a pure joke. TA get this loser out of the house before we all puke. Have they announced a new task for TA. I hope it’s better than their “Physical threat”, Amber. They have not announced the new task yet. They are usually announced at the end of Thursday nights show for Julie to tell us. Todd, you are the best!!! Thank you! They haven’t given them to us yet. Wow I missed a lot of your updates. I’ve been out of the BB loop since Friday!!! I need to get caught up, finally watched Sunday’s episode last night. thanks! I don’t get on over the weekends either but I guess we all have BB bad. This site has the best posters. I go on every day – I really need to get a life hahaha! I have never gone on another site, why bother, right Todd? Yes he does need help. I wonder if he ever had a girlfriend before, sure looks like he has not. Remember Natty and Matty! That girl was NUTS! She’s now married and has a child. Lol…nope. His name is Jesse. Send on a vacation with The Beiber, Myley Cyrus, Lindsay Lohan and Mayor Rob Ford…and he will seem normal. Nooo!!! Don’t send him to Canada, we have enough nut cases! Am I included in that group? The whole Amber/Caleb thing is getting ridiculous. If your best date ever is sitting in the backyard having an awkward conversation with a girl that’s not into you then you have problems. He said his last girlfriend hated his guts. I don’t even have to wonder about that statement. It’s most assuredly true. I worry about this guy. I really don’t think he’s a physical threat to her. But he doesn’t hear the word no. Persistence is one thing….obsession is a whole other ballgame. Right on Cat. His new name is Looney Tunes. Caleb in a narcissist idiot!!! He will never realize that Amber can’t stand him. It’s all about Caleb in his head. He’s got to go!!! And they had that chance this week….silly Cody! Yes he needs to go. OMG It was utter torture watching this “date”. I was all “you got to be kidding me!” And he roped Nicole into helping him set it up. Poor Nicole, she’s too nice to say no! Too nice? Too stupid is more like it. It seems that it is time to put my plan into action. The Detonators have to win both HOH’s spots. I would make a deal with Donny to make him a member of the alliance if he agrees to help get rid of Caleb. The first HOH should nominate Amber & Nicole. They have been the strongest women in the game. The second HOH should nominate Caleb & Hayden. That way the men will throw the competition to save the women. If the eviction vote comes down to Hayden & Caleb then we all know that Hayden is more likeable than Caleb, and that Caleb will be going home. If any of the men win, or gets the power of veto then I would use Jacosta, or Victoria as a replacement nominee. The only person that would try to save Caleb would be Victoria because Caleb did her a favor by giving up the veto for money. Victoria has expressed her disgust at Caleb. She would vote him out. I wouldn’t call what he did as doing her a favor. I would call it greed getting in the way of common sense. She owes him nothing. I agree, I don’t think Hayden would try to throw a comp. He is nothing like Caleb, he likes Nicole but isn’t crazy. He wants the money and then he can get the girl. I don’t think either of them will get the money though!! Greed, or a favor it makes no difference. Caleb has to go. Jacosta, Victoria, & Hayden are more likeable than Caleb. It is possible that Hayden wouldn’t throw the competition, but that is why I would have him on the same team with Caleb. We all know that Xaleb will throw the competition. Of course Hayden would be pissed, but that is part of the plan. Oh yes, if by some chance the men do win the chopping block competition then you can get rid of the women. Preferably Anber, but Nicole will do fine as well. It will be fun watching Hayden & Caleb campaigning to save there women. I would put up Derrick and Frankie with Caleb as a backdoor option if one of them get off the block! I would do the same thing George, and I sure hope it is Donny who gets HOH and does it. He will shake up that BB house fast. That wouldn’t work because you are giving the HG’s a choice, and you don’t want to do that. You want someone who the people WILL NOT vote for. That way Caleb has no chance of escaping eviction. I understand that you are not a Frankie & Derrick fan, but you have to think things through without your emotions clogging your judgement. That’s where Cody screwed up. I chose Hayden because he has feelings for Nicole, and he will try to save her. Also he is more likeable than Caleb. It all comes down to picking your battles wisely. Derrick & Frankie can wait another day. Caleb has to go now. I get where you’re coming from George but Caleb is not a threat to Donny’s game. Derrick and Frankie are. Caleb isn’t really a threat to anyone’s game at this point. People just want him out cuz he’s lost his marbles. I say go after the big threats. No emotion invovled there. Just looking out for Donny. Don’t get me wrong. I like Donnie too, but if he doesn’t get into an alliance soon then he will be a target. I am just talking tactics here. Sometimes I think I lost my marbles just listening to Victoria talk.